November 3, 2010 – Hollywood: Artists For A Better World International has published a video of the selected works to represent the 2010 AFABW Mail Art campaign. As made apparent in the following Mail Art video, the selections of hand-decorated postcards, cards and envelopes comprise a variety of global perspectives of the Mail Art genre. 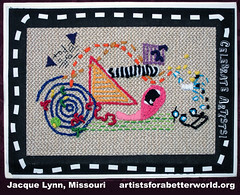 AFABW President, George Alger said, “In addition to honoring artists, this Mail Art campaign was designed to raise awareness for the establishment of an international holiday for the arts, referred to as ‘ART DAY,’ which is celebrated on the second Friday in each August.” (This year’s 12th annual Art Day was on August 13, 2010). View the following video to enjoy the diversity of AFABW’s 2010 Mail Art selections. Artists For A Better World International has a purpose to raise the awareness of worldwide artists about using their creative powers to benefit mankind by leading the way to a better world and by supporting like-minded public benefit organizations that advocate humanitarian benevolence. The group cultivates international artistic participation by way of constructive, inspirational and creative projects as well as working hand-in-hand with other community advancement organizations. AFABW activities include art and social betterment projects and/or events conceived to foster heightened awareness with and through art and artists, to help build a better world through aesthetics. Add your artwork to the AFABW Artists Directory today!